Mark C. Reynolds Blog: Golden Anniversary | Like the Nation it Covers, American Heritage was Revolutionary at its Birth. And like that Nation’s Story, Ours is a Real Cliffhanger. Golden Anniversary | Like the Nation it Covers, American Heritage was Revolutionary at its Birth. And like that Nation’s Story, Ours is a Real Cliffhanger. It is rare for any magazine to live half a century. This one’s unusual longevity has been immeasurably helped by the circumstances of its birth, when a brilliant array of people came together hoping to produce a publication for all those interested in our American story. 1, for one, have a personal stake in this account, as my father, Robert L. Reynolds (1924-81), was on the American Heritage staff—ending as managing editor—from 1958 through 1970. But even for those with no familial tie to the magazine, the story of how the founders and staff of Heritage brought it about is a fascinating one. The founding quartet already had a success on their hands when this photograph ran in Time Magazine early in 1958. 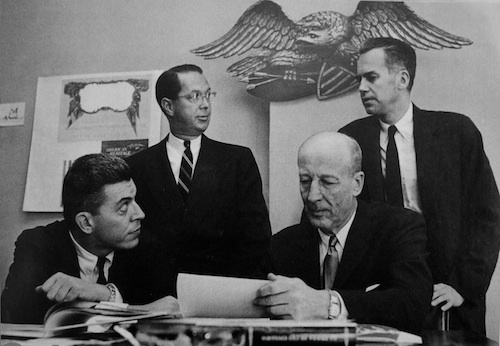 From left, Oliver Jensen, James Parton, Bruce Catton and Joseph Thorndike. It was almost no story at all. Research published here for the first time reveals an undertaking that came within hours of complete failure. But the founders were as tough and persevering as they were gifted. Not only did they save an evidently doomed enterprise in its infancy, they passed on to their successors a tone and quality, set 50 years ago this month, that still rests squarely upon the shoulders of James Parton, Oliver Jensen, and Joseph J. Thorndike, Jr. In 1953, Thorndike, then 40, Jensen, 39, and Parton, 41, were three very different individuals who nonetheless shared not only a New England Yankee background and Ivy League schooling at Harvard and Yale but most of all a love and respect for the written word that kept them together for two decades. All of them already had distinguished careers in publishing, but it was during those 24 crucial months between the autumn of 1953 and another autumn two years later that all three came to understand that what they’d made would last and would be the legacy they’d be remembered for. Joseph J. Thorndike, Jr., had gone to Harvard with James Parton, and on the Crimson he began what would be a lifetime of writing and editing. After graduation Thorndike joined the staff of Time, later moving on to its fledgling off-shoot Life, where he became managing editor. But after 13 years he found himself restless to be on his own, so in 1950 he teamed up with his friend and Life colleague Oliver Jensen. Jensen had seen publishing at its most desperate while on the staff of the expiring humor magazine Judge and had served in the Navy and written a fine account of carrier war in the Pacific. Now the two young partners were scrabbling for editorial work for their freelance consultancy firm, Picture Press, finding stability when they won the contract to produce an elaborate fiftieth-anniversary book for the Ford Motor Company. More than anyone else, it was James Parton who made American Heritage a practical reality. In November of 1953 he attended a board of directors’ meeting of his old prep school, Loomis, near Hartford, Connecticut. While there he spotted a slim publication entitled American Heritage sitting on the desk of the headmaster, who told him, “That is one of Winthrop Rockefeller’s struggling projects.” Minutes later, Mr. Rockefeller, also a board member, said this wasn’t true at all. He put Parton in touch with the publisher, the American Association for State and Local History (AASLH), in Albany. Losing no time, Parton sent a letter on December 22, 1953—and traveled upstate two weeks later—to offer the services of TJP to the publication. This letter is the first documented step leading the three men toward forming a new company that would own (in 7 months) and publish (in 12) a very much more substantial American Heritage magazine. In the early months of the new year, Parton analyzed the editorial and financial aspects of the magazine and quickly reached the conclusion that rather than be advisers, TJP should take over the entire venture. Thorndike, Jensen, and Parton would be publishing in effect a third incarnation of American Heritage. The first had made its debut in January 1947 as a 32-page black-and-white publication selling for the then not inconsiderable price of one dollar a copy. Its editor, Mary E. Cunningham of the New York State Historical Association, targeted it to the secondary-school market, achieving a modest circulation of 800. This first Heritage was improved when taken under the wing of the AASLH beginning in 1949. Published as a quarterly under the editorship of Earle Newton, with expensive four-color illustrations and annual subscriptions selling for three dollars, it ran contributions submitted gratis by staff members or friends of the association; the high printing costs precluded any payments to authors. This true labor of love was carried on nobly for four years until Newton, near exhaustion both financially and physically, noted in the association’s newsletter of September 8, 1954, that the cost of obtaining new color plates for the past summer’s issue had been the straw that broke the camel’s back. The first pressing order of business now was to obtain ownership from the AASLH. Parton asked to appear at their next meeting—in a month’s time on April 21,1954, in Madison, Wisconsin—for the sole purpose of requesting the association’s vote to sell their magazine. When he arrived at the Hotel Loraine, it was discovered, to the dismay of all in attendance, that with 12 members present they were one shy of a quorum. With the clock ticking, a frantic phone call went out to another member, Henry D. Brown of the Detroit Historical Society, imploring him to come immediately to Madison. Brown arrived at midnight, and his yea vote cleared the first hurdle in the eventual transfer of the magazine to the newly formed American Heritage Publishing Company, Inc.
Now Parton faced an even more daunting task, raising $50,000 by June 30, only a little more than two months away, to capitalize the venture. Otherwise, said the contract, “the magazine and all its assets” would revert to the association. The clock was ticking even more insistently. The next nine weeks saw an outpouring of letters and phone calls from New York to potential investors. Touting the new publication as “a handsome, lively magazine devoted to our country’s history … aimed at a cross-section of intelligent Americans,” Parton received commitments from Marshall Field III of the Chicago real estate family, James Sachs of Wall Street, and Robert Strauss of the Macy’s fortune, all old friends of his. Now the larval magazine needed an editor. The position was first offered to Earle Newton of the AASLH. Newton accepted but soon withdrew. He did not wish to live in New York City and would have liked the New York crowd to relocate to New England (preferably Sturbridge, Massachusetts). After a second candidate, the Columbia professor John Kouwenhoven—whose magnificent newly published illustrated history of New York City might have served as a template for the magazine’s highest editorial aspirations—turned the partners down, their third choice proved the charm. The inaugural cover bore an emphatically American vision painted by an unknown artist about 1840. Thorndike traveled to Washington, D.C., to make a formal offer to Bruce Catton. A former newspaperman, Catton had been born in 1899 in Petoskey, Michigan, and grown up in nearby Benzonia. World War I had interrupted his studies at Oberlin College, and though he tried twice afterward to finish, he found himself repeatedly pulled away to work for a succession of newspapers, the Cleveland News, the Boston American, and the Cleveland Plain Dealer. (He was awarded an honorary degree from Oberlin in 1956.) Too old for active service in World War U, he put his formidable writing skills to work as information director for the War Production Board. He left the government in 1952 to begin writing A Stillness at Appomattox, which won both the National Book Award and the Pulitzer Prize in 1954. After hearing Thorndike’s proposition, he had some reservations, thinking he would stand too much in contrast with the Ivy League founders. But these hesitations melted away when he met the three men in New York. He accepted on August 1,1954. With Catton aboard, Heritage immediately acquired a cachet that later attracted great writers, additional financial backing, and respect in the publishing field. Benson’s business acumen lent order to impending chaos, as the numbers from the mailing lists that Heritage culled eventually neared seven million. In that precomputer age, Heritage, out of necessity, created “mail purge”—by successfully labeling the order cards, alphabetizing by post office, and removing duplicates—all painstakingly done by hand. By the late fall of 1954, prepaid subscriptions were coming in at the rate of 300 a day. Glusker recalls the sheer exuberance that met each day’s tally: “These guys [Thorndike, Jensen, Parton] started jumping up and down, flapping their wings over two or three percent returns.” Parton was quite clear on what these returns meant: “The $50,000 we spent on promotion brought in about $700,000 in pre-paid subscriptions … giving us in effect the capital to operate.” He put the money right back into more mailings. By the time the first issue appeared, Heritage had 40,000 prepaid orders; by the third issue that number had reached 100,000. 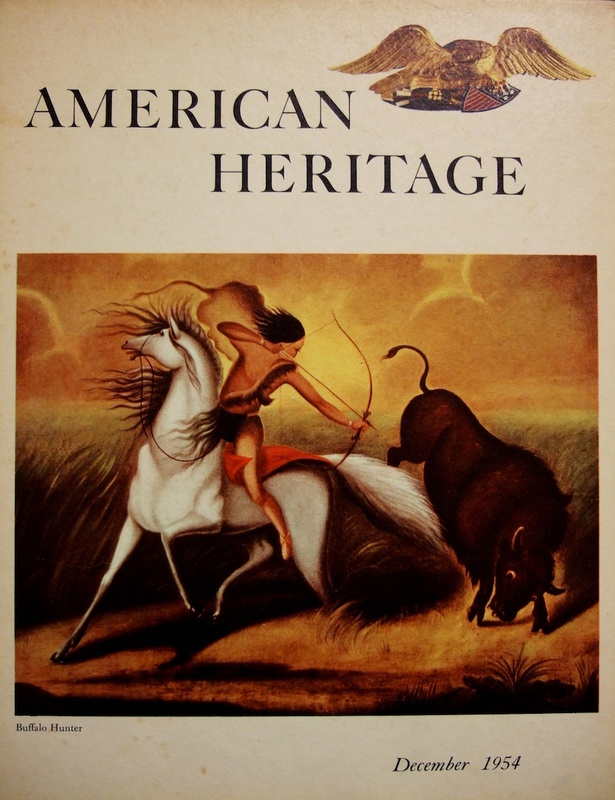 American Heritage not only found itself widely popular but quickly attained the respect accorded such venerable journals as Harper’s, The Atlantic Monthly, and Scientific American. The three founders took equal satisfaction from the reviews: “An extremely promising project… the most ambitious attempt yet made to merge readability with historical scholarship … its auspices are distinguished,” Orville Prescott, The New York Times; “An extraordinary performance,” Joseph H. Jackson, the San Francisco Chronicle. Stephen W. Sears, then a young new employee, remembers an excited, exhausted staff gathered around that first issue, so recently off the press it was still unbound, laid out page by page across the office floor. Oliver Jensen’s article “The Old Fall River Line” led the table of contents, capturing the era of the big side-wheelers that plied Long Island Sound between New York and Massachusetts. What followed was the eclectic array of subjects readers would come to expect from American Heritage, from Allan Nevins’s profile of Henry Ford to a fondly sardonic look at some famous New York social clubs; from that “suburb of hell” Panamint City, California, during its boom days, to reminiscences of the late advertising genius Albert Lasker. Sears, who later became a celebrated Civil War historian in his own right, was hired straight out of Oberlin College, and at 22 he found himself working immediately under Catton and with the gifted picture editor Joan Paterson Mills. Joan Mills had roomed with F. Scott Fitzgerald’s daughter, Scotty, at Vassar and majored in child psychology; later she had worked a short reporting stint on Adlai Stevenson’s 1952 campaign. Her longest and only “real” job, according to her daughter, Ally, was at American Heritage. Frequent “picture meetings” explored every possible way to illustrate the stories; Mills would then go to search the New York Public Library, the Bettmann Archives, Brown Brothers, the Culver Picture Service, and she would go far afield. She discovered in out-of-the-way historical archives much that has since become part of the visual canon of America’s past. Sometimes inspiration struck closer to home. Sears remembers being sent on a mission and returning with several battered doors from a junk dealer in Long Island City to provide a background for a photo to illustrate an article about the American West. Parton put in an order for 80,000 copies for the first issue. They sold out in 10 days. But however careful the company was with every penny, Parton calculated that by the following June “our cash would be all gone because it would be time to renew our subscriptions, and until we could put out a renewal letter, we wouldn’t get any more cash flow in.” He “battened down our hatches, figuring we’d have a very grim summer.” Almost as an afterthought, Parton tacked a postscript onto his renewal letter offering a lower rate of $18 for two years, a savings of $2. To his amazement, half the subscribers chose this option, bringing in an unexpected, very much needed $100,000. One miscalculation, however, whose consequences were gathering like a storm cloud just ahead, seemed certain to wreck the newly launched vessel. As it happened, the magazine, which drew its life from the U.S. mail system, fell under the more expensive parcel post rate once a postal ruling stated that “Heritage could not claim book rate [although] it had hard covers and neither could it use the periodical rate of a magazine.” The bill for mailing the first issue totaled $24,000. By the end of 1957 it hovered at $36,000 per issue, or $216,000 annually. In five short years American Heritage had grown from a slim quarterly with 10,000 subscribers to a vigorous 120-page hardbound bimonthly, topping 310,000 in circulation. Later on, Parton occasionally liked to recapitulate how he and his partners had gone about things. Heritage knowingly violated all the conventional rules: It had little startup money and no advertising, charged the highest price, used expensive printing, sank twice the capital anyone else ever had into promotion, and, in the most audacious of editorial choices, picked history as its subject. American Heritage’s story is unique in publishing. The magazine continues on today by reminding Americans that we all matter, that we all are part of an epic that is still unfolding and will be ready, one day, to be received and read by generations to come. Mark C. Reynolds is a freelance writer living in New York’s Hudson Valley.